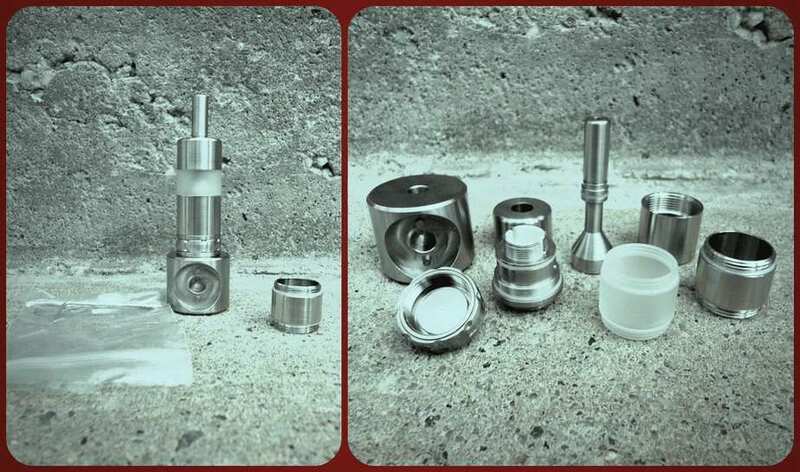 The Rose V2 rebuildable atomizer is unique and beyond comparison to any other rebuildable style atomizer presently available on the market. The authentic Rose V2 atomizer is made by Eden Mods, who is a modder out of the United Kingdom. 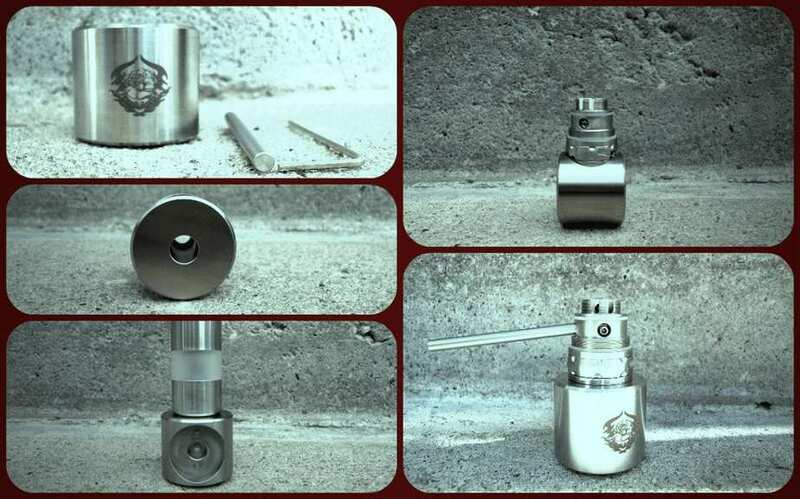 The Rose V2 atomizer sports unique design elements such as a postless coiling system, hidden catch screws, removable ceramic deck cup, and a beautiful stand that doubles as removal tool, and building assistant. With a version 1 of the Rose atomizer proceeding it, the Rose V2 brought with it upgraded features such as larger air flow, an adjustable 510, larger coil holes, peek insulators, and a new finish just to name a few. 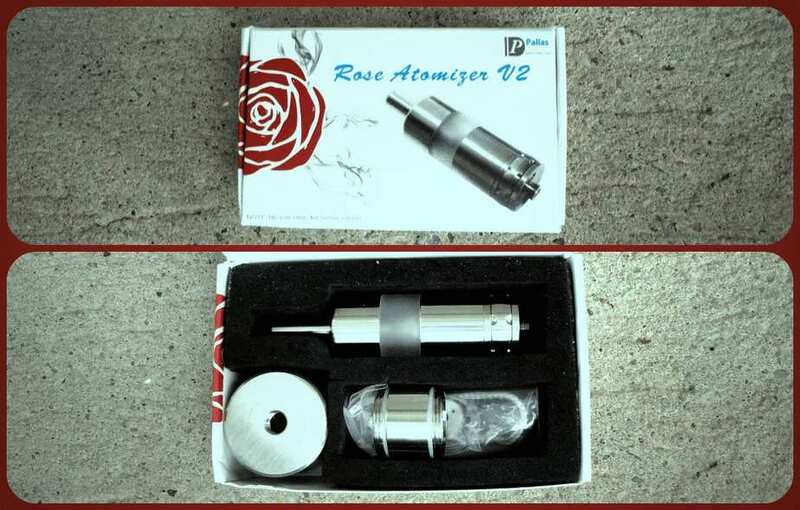 The authentic Rose V2 atomizer retails for $235.00 USD, and is available at select online retail shops worldwide. The Rose v2 atomizer clone featured in this review is made by Jiangmen Pallas Technology, LTD, and is a 1:1 replication of the authentic Rose V2 by Eden Mods. The Pallas Rose V2 clone is available for purchase at Focalecig.com, in their US Warehouse and retails for $35.00 USD. For those who are unfamiliar with the unique design aspects of the Rose V2 atomizer, this device can appear to be very intimidating most especially when you begin to dissemble it. 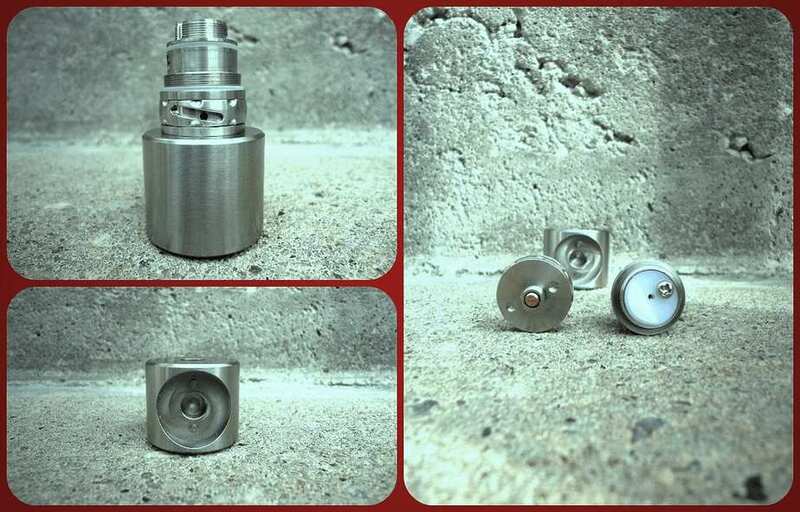 The entire device is well machined and does feel like a quality atomizer. Upon initial inspection, all of the parts and pieces fit together properly, although I did notice a few micro dings around the lip of the deck. The main body is comprised of six major parts and four minor parts. For the main body there is the top cap, chimney/juice control, middle tank section (choice of polycarbonate or stainless steel), bottom tank, main deck, and base with air flow control ring and positive circuit plate. The minor parts include a removable ceramic build cup, two hidden grub screws to catch the coil leads, and a positive contact screw under the build deck. The parts and tools package include the stand/removal/build tool, an allen wrench, an extra ceramic cup, extra grub screws, spare orings, and a small amount of braided silica wick and nichrome resistance wire. The multi-purpose stand/removal tool included with the Rose V2 is one of the more unique and intriguing aspects of this device. The stand has three basic functions, one side of stand has a hole to fit the juice control/drip tip so that you can keep your tank inverted while you work on your build. The opposite side is female 510 threaded so that you can screw on the atomizer and use the stand to hold the deck while you build on it. And finally there is a double pronged seat that is used to assist removal and separation of the base from the deck. As I mentioned above, because Pallas changed the tolerances of the Rose V2 clone, this aspect of the stand and bar tool are genuinely not needed at all. It is very easy to separate the deck from the base by hand. Also, I would even go as far as to recommend that you do not use the bar tool to tighten the deck to the base because you are far more likely to simply tighten the base down into the stand instead, and the base will become stuck in the stand tool ‘ which I know from experience, so feel free to take my word for it and spare yourself the trip to the freezer and breaking out the pliers. The base of the atomizer has a 2mm air hole, and an adjustable air flow control ring which is easy to adjust, unlike the authentic Rose V2 which actually requires some sort of lubrication under the AFC ring in order to move it. This is certainly a plus for the clone. As previously mentioned, the deck does separate from the base with AFC ring and does not require any tools to separate them, even as the stand/removal tool is included for this purpose. In addition to a AFC ring, the base also has an adjustable copper 510 pin which I very much appreciate. While most mechanical mods offer some type of adjustable 510 connection for flush mounting there are plenty of regulated devices which do not so having an atomizer with an adjustable 510 pin is a huge plus. Please keep in mind that since the 510 pin is bare copper and it will need to be periodically removed and cleaned to maintain good conductivity. The use of PEEK insulation underneath the build deck is also another plus due to their ability to withstand high temperatures. There is also a phillips head screw under the deck which acts as the positive contact point between the positive coil hole on the deck and the positive circuit plate in the base of the device. The deck utilizes a post-less design, with two coil holes representing the positive and negative lead connections instead. This is both brilliant and perplexing to those looking at this device for the first time. The ceramic cup is removable and this device can be built and used with or without the removable ceramic cup in place. At the center of the deck you will find the air flow hole, and the positive and negative coil holes on either side. There are also dual wick channels cut out on both sides of the deck which are to be used regardless of single or dual coil configurations. On either side of the outer deck there are hidden grub catch screws which correspond to the positive and negative coil holes. This is where you will catch and secure the coil leads on your build, with the assistance of the included allen wrench key. The Rose V2 atomizer can accommodate both single and dual coil builds. I have seen builds for the Rose approached in several different ways, so there is no one way to get this done. It is a matter of finding the approach that will work for you and that will create the result that you are looking for. 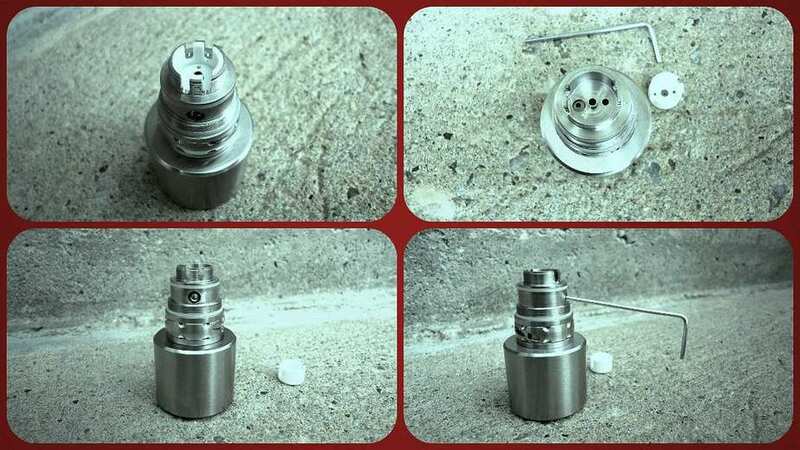 The most challenging aspects of this rebuildable atomizer are coiling and wicking. Once your coil is wrapped , whether single or dual coil, determining the proper lead length and clipping the leads to size is necessary for proper installation. Your leads need to be long enough so that they can be placed far enough into the coil holes for the grub screws to catch them. But you also want to make sure that the coil aligns with one of the wick channels on both sides of the deck so that you can wick the coil after it is installed. 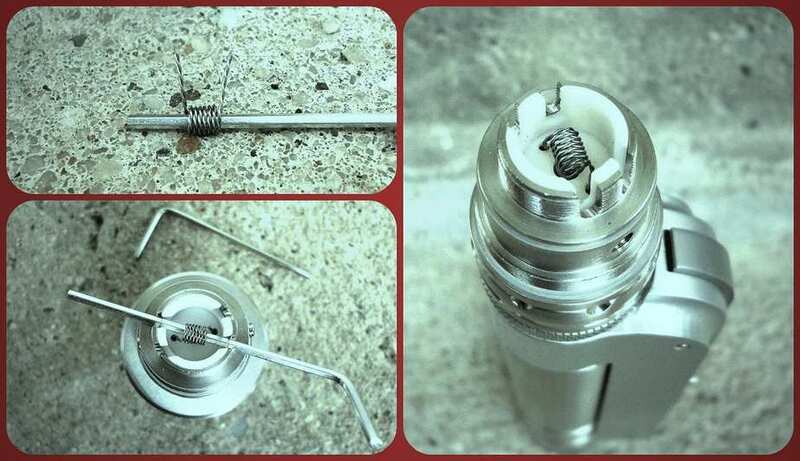 However, you can opt to pre- wick your coils prior to installation. I opted for a single coil build with twisted 30 gauged Kanthal wire with a 6/7 wrap on a small screw driver (1.14 ohm result). While I have not found any definitive guides for how long the coil leads should be, I applied instinct and clipped the leads to what seemed like a reasonable length. My instincts proved sharp because the build shown below is the one and only build I have done for the Rose, and three weeks later I am still using the same build. Before installing the coil you should unscrew both hidden grubs on either side of the deck. Luckily I had a second allen key which I used to install my build by placing the coil on the allen key, then laying it horizontally in the wick channels, which also helped me keep the coil aligned with the wick channels so that I could wick it after installing my build. Again, you need to make sure that the coil leads are far enough to the coil holes for the grub screws to catch, otherwise your resistance meter will be jumping all over the place when you try to meter your build. If this should happen after you install your build, just unscrew the grubs with the supplied allen wrench and gently knudge the coil further into the coil holes and hold it there with your finger while you tighten up the grub screw. Also be mindful to make sure that the coil does not touch the center air hole otherwise you will short out your device when you try to fire it. Now for the next challenge of wicking your coil, which is not hard as much as it can be a tedious task. I suppose that is why some have chosen to wick their coil prior to installation however, from my perspective I do not like having to excessively handle my wicks for fear of transferring too much dirt and oil from my hands to the wick, even as I do wash my hands prior to building. The necessity of having to pick up and put down building tools repeatedly during this build process means that my hands are bound to become contaminated again even after washing them. In order to prevent flooding your device you will need to fill both wick channels on both sides of the deck for single and dual coil builds. After feeding the cotton wick through the coil and out of one wick channel even up the tails of the wick on both ends in preparation for the next step. Next, taking one wick tail which is already extended through a wick channel, then double the wick back over and through the same channel. Then bring the remaining wick tail through the inside of the deck and out through the wick channel next to it on the same side. This same process is then repeated on the other side of the deck. Once wicking on both sides of the deck is complete clip the excess wick tail as close to the wick channel as possible. I have also seen many examples where the builder simply split a single wick into two parts and places one piece of the split wick into each wick channel. I chose not to go this route because cotton wick is delicate and can rip apart while handling and if you do accidentally rip your wick while trying to split it you are screwed, and then you must start again. I usually opt for the path of the least possible aggravation, lol. Now it is time to fill your Rose V2 clone with e-liquid. 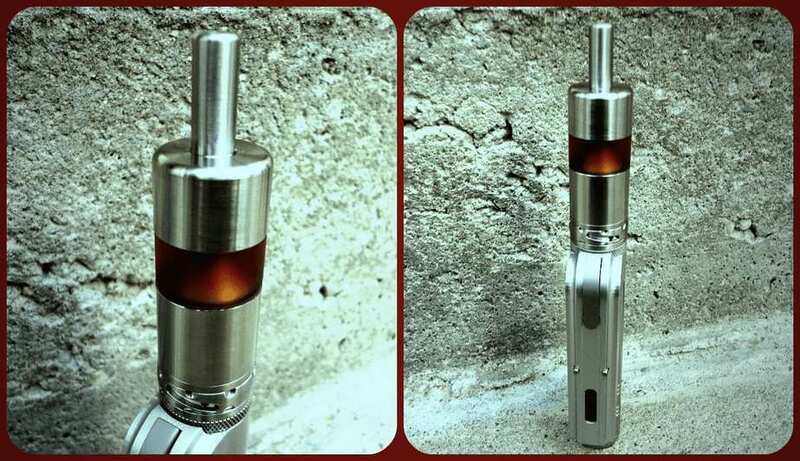 The chimney style is a bit reminiscent of the Squape atomizer in that it is installed into the top cap of the device prior to being screwed down to the deck. But it is also like the Aqua RBA with a drip tip that also acts a juice flow controller, which is screwed to the right to tighten down, and screwed to the left to open up. Before you fill the Rose V2, install the chimney/drip tip/juice control through the center hole of the top cap and pull up until you feel the o ring on the juice controller catch. While inverted fill the Rose with e-liquid through the space between the tank and chimney, and be careful not to pour e-liquid down the center which will come out through the drip tip. With the tank still inverted, take the base of the device and screw it completely into the tank and then flip it over. 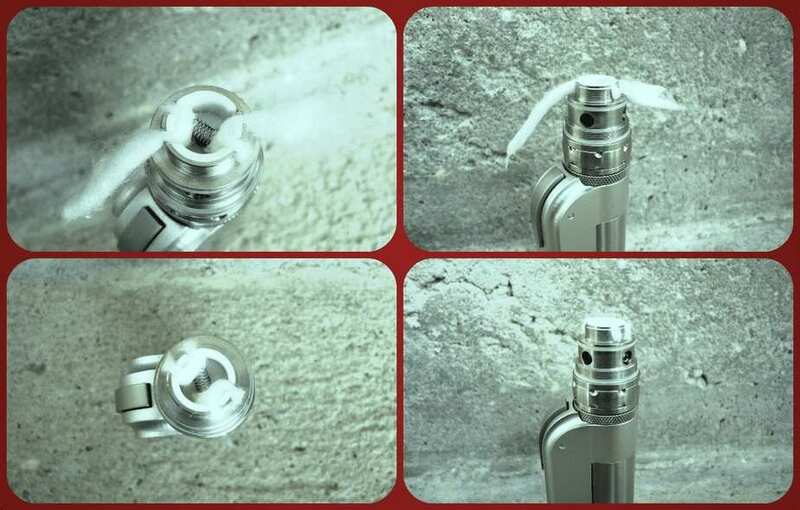 In the photo demonstration below you will see what the drip tip/juice control looks like when it is completely tightened down (top pic), and what it looks like when the juice control has been opened. The degree to which you will open the juice control depends on the thickness and type of wick you are using, as well as the thickness of your e-liquid. Trial and error will apply here however, you can feel/taste it when the wicks are not being feed enough e-liquid, and you will also be able to immediately tell if it is getting too much e-liquid because there will be gurgling. If you should find that your device is gurgling, immediately close off the juice flow and either vape off, or blow out the excess e-liquid from the chamber and slowly adjust the juice control again. The authentic Rose V2 atomizer has gained quite the reputation for itself as a stellar flavor maker. Well, I can confirm that the same is true for the Pallas Rose V2 clone. In fact, the superior flavor production of the Rose V2 was immediately apparent upon my very first vape. I have also heard the flavor production of the Rose V2 atomizer compared to that of a dripping atomizer, and I am inclined to agree with this as well. For me the flavor production of the Rose V2 easily beats out the Taifun GT, which is also known as a great flavor producing atomizer, and it most definitely beats the Kayfun Lite Plus V2 on flavor hands down. In fact the Kayfun starts to seem a little more like a clearomizer after a few days of vaping with the Rose V2. I find that the 2mm air hole at max open makes for the perfect air flow and draw as well. While the air flow is adjustable, for me there is no reason to adjust it, even as I have tried the Rose with the air flow half way closed off. The draw of the Rose V2 is smooth and in this regard it very much reminds me of the Taifun GT which is also a smooth and quiet vape. And I cannot neglect to mention the throat hit, which is .. so utterly satisfying. Again in my opinion, the Rose V2 is superior to the Taifun and Kayfun atomizers on this front as well. Now let me talk a little about the things that I don’t like, and there two. First, I do not like that when I attempt to unscrew my tank to refill it that I actually end up unscrewing the deck from the base 4 out of 5 times. Then with the deck separated from the base I have to unscrew the tank from the deck and reinstall the deck to the base ‘ this is annoying. And it also leads me to believe that Pallas got it a little wrong in terms of which tolerances on this device they chose to alter. The second little gripe is that I also find that the Rose V2 needs to be re-wicked more often than any other RBA that I own. As it is cotton wicks do not last that long, and for the Rose V2 you should expect to cut the life expectancy of your wick in half, at least with cotton wick. Using the Rose with dark colored, sweeter e-liquids I find that a cotton wick last about a full day to a day and half before things start tasting janky. And being that the Rose is not as easy to re-wick as a Kayfun, some eye rolls and heavy sighs may start to happen after the second or third re-wicking of this device. The good news is that the Rose V2 clone ultimately makes up for these small annoyances by providing an absolutely stunning vapes. While discussing the Rose V2 atomizer with some fellow vapers, I likened the vape to the aesthetic appearance of the Rose V2 which is elegant and refined. Clearly the China cloner’s have done it again because the Pallas Rose V2 is a huge win. I have read the feedback of no less than 4 owners of the authentic Rose V2 by Eden Mods who have also purchased and compared the Rose V2 clone and all agree that the vape quality is identical. 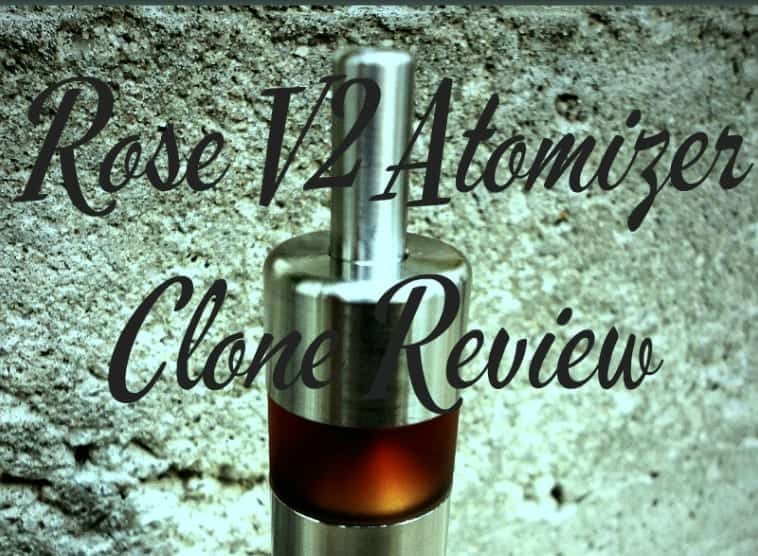 The Rose V2 clone atomizer is a like breath of a fresh air in a market where bottom coil style atomizers are not being created and produced at the same rate and frequency as mechanical mods and dripping atomizers. The market needed this atomizer. There are three confirmed manufacturers of the Rose V2 clone, Jiangmen Pallas Technology, Shenzhen Lambo Technology, and Shenzhen Cigreen Technology which is being resold under the Infinite Brand. The different clone manufacturers are easy to identify through packaging and finish. 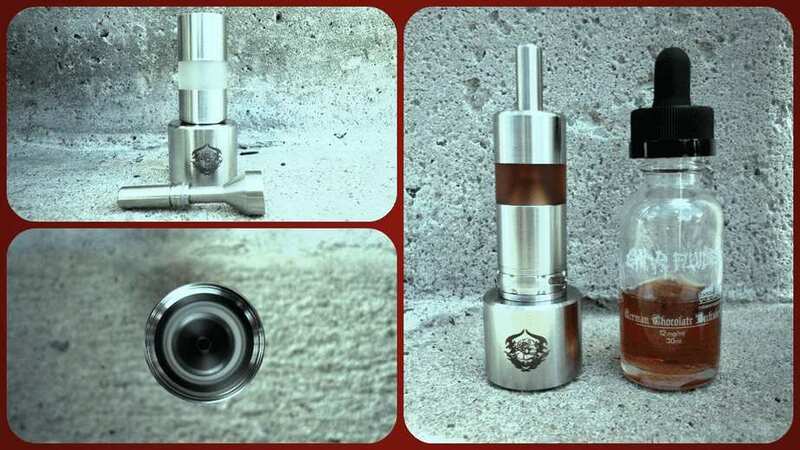 The Pallas Rose V2 clone comes in a Pallas branded box, is available with and without the stand tool, and has a brushed finish minus a logo on the bottom of the atomizer. The Lambo Rose V2 clone is the only clone that is packaged in a cloned Eden Mods box, a complete kit standard, and has a polished finish with logo. 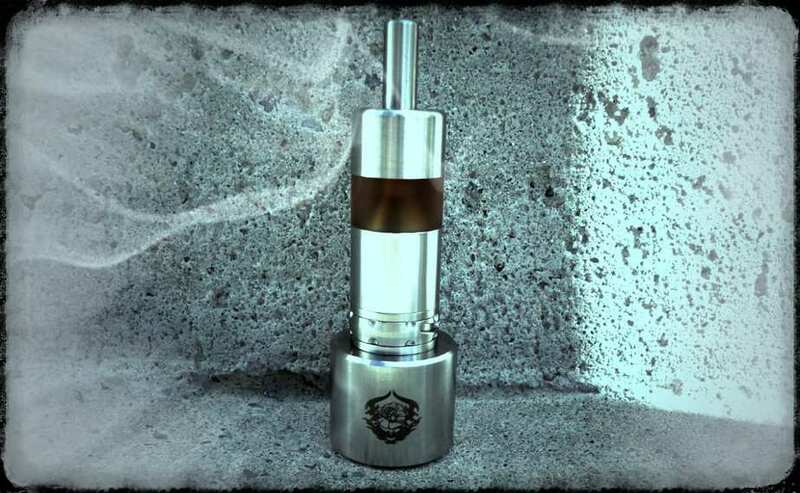 And the Cigreen Rose V2 clone comes in a standard black box, is available with and without a stand tool, and has a brushed finish with logo. While the Rose V2 is a bit more fiddly than the average rebuildable tank atomizer, the pay off is huge because this atomizer really does deliver a beautiful quality vape. Being more fiddly in nature and with far more parts and pieces to the assembly than your average RBA, I wouldn’t recommend the Rose V2 to a new vaper, or someone who is getting into rebuildables for the first time. But for those vapers who have been around the block, and seen their fair share of Taifun’s and Kayfun’s, I cannot imagine that you would not be very happy to add the Rose V2, whether it be the authentic, or the clone, to your arsenal. Another great review! I have been using mine for about 2 months now and have the same exact thoughts as you. Wicking and putting in coils gets better over time. I haven’t touched any other atty since picking the Rose up. I now have 3 :). Good review. I got the $30.01 clone from Fasttech. I don’t know the manufacturer, but I don’t think it’s by Pallas. 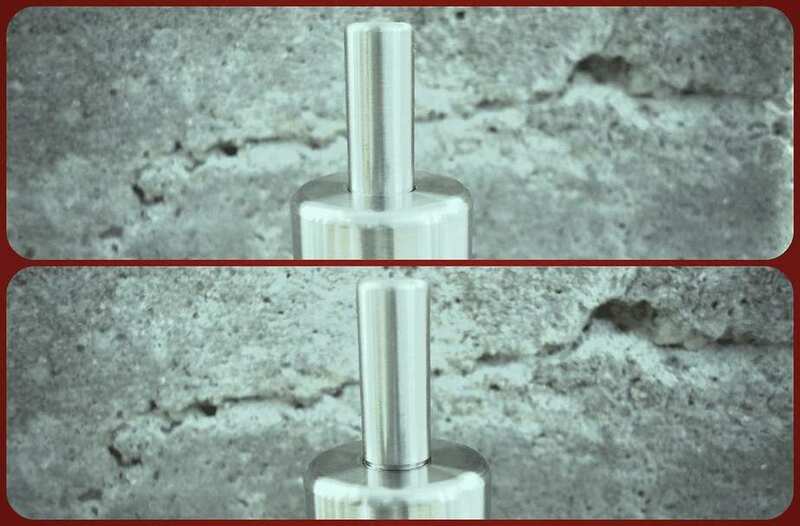 Based on the pictures, it seems like mine has more of a mirror finish and it has a logo on the bottom of the atomizer. I believe the tolerances of the Fasttech clone is closer to 1:1 with the original device. BTW you should not use the bar tool with the atomizer screwed into the 510 hole of the stand. The bar tool is meant to be used with the stand flipped on its side and the atomizer fitted into the slot with the two bumps sticking out. I agree the build is definitely very finnicky and challenging but the flavour from this thing is amazing. I’ve been using it for about a week with some Suicide Bunny Sucker Punch and haven’t had to rewick it yet, although I’m sure this is very dependent on the juice that you are using. Is Lambo Technology the same ones that make the VV tube mod? It’s been about a week and my coils are finally getting gunked up enough to rewick. I’m just using regular organic cotton with a twisted 28 gauge macro coil at 1.5 ohms. I’ve been running it at 6.5 volts / 27 watts with vapour rivaling my Orchid and Fogger 4.1 and flavour leaps and bounds above all my other RTAs. I believe the reduced chamber with the ceramic cup and tapered chimney really help to concentrate the flavour. Great review as always, I have a Rose on order. Nice review.. i want to try it.